One thing that can be challenging when eating a plant based diet is making meals that are good for you but also taste great and are exciting to eat and easy to make. Our world is faced paced and fast food is plentiful, but not usually a great option for those seeking a healthier lifestyle. Taking time ahead of meals to prepare sauces to have on hand can make a huge difference in your decision to eat a healthy and satisfying plant based diet. 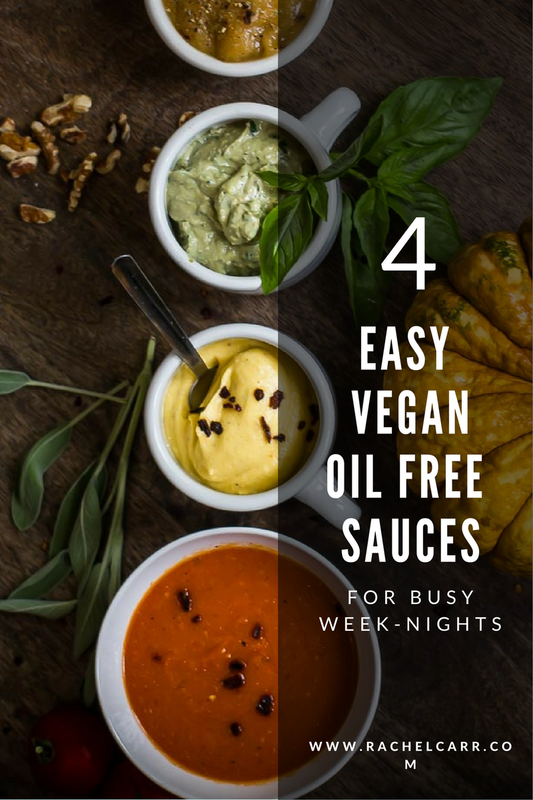 These 4 basic sauces are a great starting point-they freeze well, are made up of only a few common ingredients and are completely free of refined oils and sweeteners. They each can be used for a variety of things, so stock your freezer and let your imagination run free. 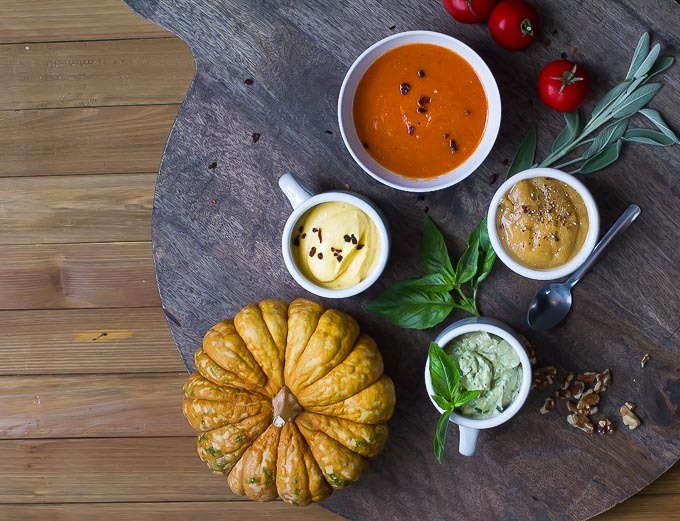 In this post you’ll find the recipes for 4 of my favorite go to sauces. Let me know what ways you end up using them in the comments below! 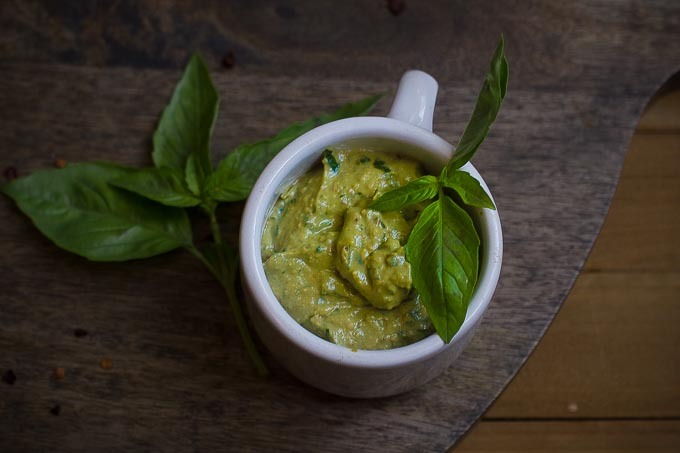 This Avocado Pesto is a great option for those of you trying to avoid oil. The avocado gives the pesto a rich texture and beautiful green color. Its great on regular pasta or zoodles, as a dip for crudite, as a topping for a baked potato or even as a spread on a sandwich. Puree everything in the food processor till creamy, adding the basil little by little. A great meatless and mushroom free option for Thanksgiving is this Mushroom Sage Gravy. The herbs and texture of the sauce bring you instantly to the harvest table. It is delicious on mashed potatoes, over stuffing, a lentil loaf, or even as a topping for a veggie burger. There is something warm, hearty and inviting about it that adds an extra flavor note to make basics more satisfying. Add the brown rice flour and nutritional yeast to a dry sauce pan and toast gently over medium heat till it turn slightly golden and you smell a nice roasted aroma. Combine all ingredients in a medium-sized saucepan. Cook, stirring, over medium-high heat until gravy boils and thickens. Check seasonings and add more as needed. Reduce heat and simmer, stirring often, for about 5 minutes. 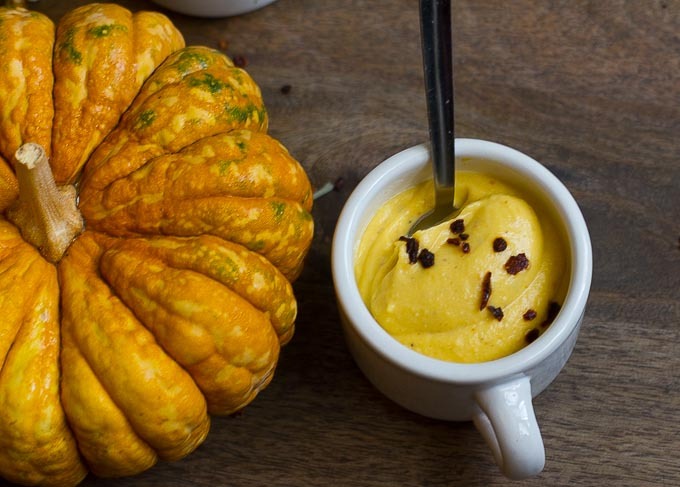 If it's too thick, add additional broth..
Have you ever thought of squash as a cheese substitute? It might seem like a stretch to some, but this sauce is one of my all time favorites. Its so versatile, you can use it for almost anything, just let your imagination go! It is a great base for vegan mac n cheese, you can use it as an alfredo base for creamy pasta, make awesome vegan nachos, as a dip with chips or veggies, as a layer for a vegan lasagna, the possibilities are endless! I promise you it has zero squash taste. The flavor is rich creamy and ridiculously cheesy. This is a sauce that even non vegans will love and kids too! 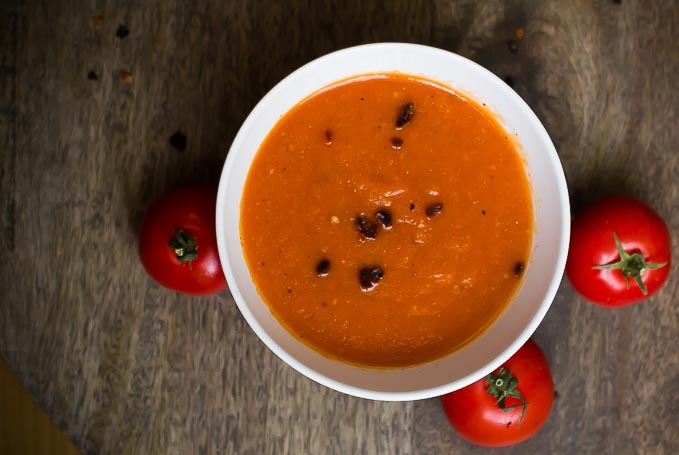 The Roasted Red Pepper and Tomato sauce is another one you will always want to have in your freezer. This gets its complex and bright flavors from roasting the peppers and tomatoes. 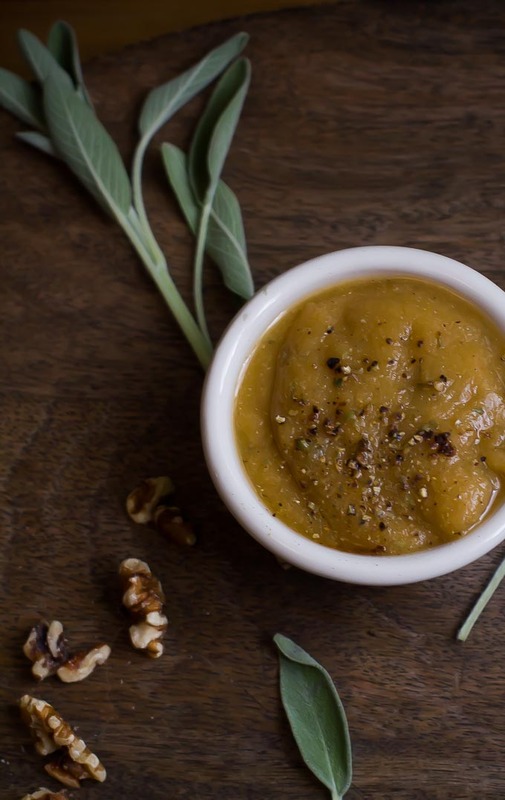 Some people find it challenging to get great flavors without relying on oil in a recipe, but once you have made this you’ll have a whole new appreciation for how great tasting an oil free sauce can be. This sauce is incredibly versatile. Use it as a base for soup, or as a pasta sauce. drizzle it over tamales or rice and beans. I even did a lasagna using alternating layers of this sauce and the squash cheese sauce. I hope you get as much delight using these recipes as I do sharing them with you! Let me know in the comments how you’re using them. Roast the peppers over an open flame (like your gas range) or grill until the skins turn black. Remove from the flames and allow to cool. When cool enough to touch, remove the skins, stem and seeds and rinse with cool water. Set aside. Bring a sauce pan of water to a boil. Score the skin of the tomatoes with a knife in an X on the bottom of each tomato. Blanche in the boiling water for 30 seconds to 1 minute, or until you start to see the skin splitting on the tomatoes. Transfer to a sieve and allow the tomatoes to cool. Rinse with cool water and slip off the skins. Place the skinned tomatoes on a lightly oiled roasting dish, season liberally with salt and pepper and put in the oven and roast uncovered for 30 minutes. Put the peeled peppers and roasted tomatoes in a blender and add the paprika and a little salt and pepper and puree. Taste and adjust the seasoning as needed. Add cayenne or chipotle if you would it spicier.